John John Florence, winner of the last two men’s WSL Tour titles, has had a slow start to the 2018 season and is in danger of losing too much ground on his rivals. After three events (there are 11 in the WSL Tour season), Florence is way back at number 26 on the WSL Leaderboard. Is that much of a surprise? Yes and no. The WSL, in both the men’s and women’s tours, is ultra-competitive, especially at the very top of the rankings. However, Florence has been the world’s best male surfer over the last two years, so his early tour struggles are surprising fans of the Hawaiian star. Indeed, bookmakers see Florence still in with plenty of time to catch his rivals and secure his third-successive WSL championship. There is a three-way tie at the top of the odds, with Florence, Julian Wilson and Gabriel Medina all priced at 5/1. Of the trio, Wilson is the only one currently atop the rankings, a position he shares with Brazilian Italo Ferreira on 13,330 points. Co-leader Ferreira, who is given odds of 6/1 for the championship, shot to the top of the Leaderboard after a fine win at the Bells Beach Rip Curl last month. While Ferreira deservedly took the plaudits for a brilliant performance on the waves, the event was also notably for being the last competitive performance of Australian surfing legend Mick Fanning. Ferreira and Fanning contested the final, but there would be no fairy-tale ending as the Brazilian came out on top. While Fanning will be always remembered for the famous shark incident at Jeffery Bay in 2015, he should also be regarded as one of the best pro surfers to ever hit the waves, winning everything there was to win, including three World Championships. 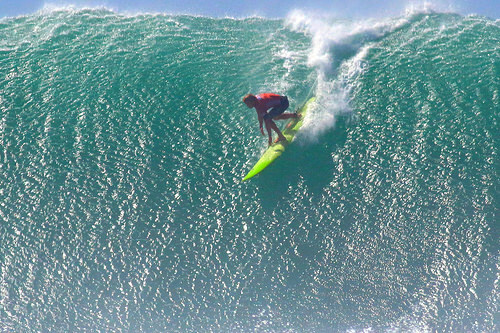 Surfing, and extreme sports in general, will feel the loss of such a high-profile competitor. As you can see from the table, defending champion Florence has a lot of ground to make up. Of course, there are other competitors going all the way up to 175/1 for the likes of Jesse Mendes and Willian Cardoso. They are huge longshots though, so check out this Betfred free bet to use on any sport, including extreme sports. The point is that Florence will have to be perfect from now until the final event of the tour, the Billabong Pipeline Masters in his native Hawaii. With Fanning’s retirement the only other former champion in the running seems to be Gabriel Medina. Thus, it is very possible that we crown a new champion at the end of 2018, someone who could perhaps help start filling the void left behind by Fanning. Although, Florence has fought through adversity before and should not be ruled out in becoming the first surfer since the great Kelly Slater to win three world championships in a row. This entry was posted in News, Surfing, Water Sports and tagged John John Florence, WSL. Bookmark the permalink.